Legendary sand artist Sudarsan Pattnaik made history Feb. 10 when he and a team of 45 students built the world's largest sandcastle. It was built on Puri Beach in India's eastern state of Odisha. It took Pattnaik and his crew nine days to complete their work. It is a sprawling castle. The words "World Peace" are written in front. It also includes a peace dove as well as medallions showing the faces of Mahatma Gandhi and Nelson Mandela. The previous Guinness world-record was a 45.83-foot castle. It was constructed on Florida's Virginia Key Beach by professional sand sculptor Ted Siebert and 19 helpers in October 2015. They worked over the course of two weeks. "It is a proud moment for the country as Sudarsan broke the previous record by building a 14.84-meter-high castle in the backdrop of the Bay of Bengal in Puri," state tourism director Nitin Bhanudas Jawale tells Mohapatra. "We will exhibit the art on the beach for two more days to attract tourists." 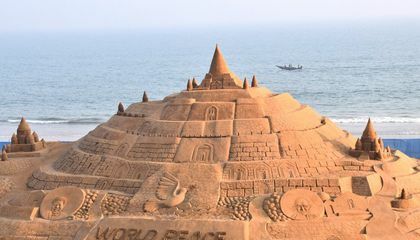 The 39-year-old Pattnaik is a professional sand sculptor, and in 1994 he founded the Sudarsan Sand Art Institute in Puri, where he teaches others the craft he has practiced since he was a child. According to his website, he more or less grew up on the beach and taught himself how to sculpt in sand, which he says was an ability gifted from God. Over the years, he's competed in many international sand sculpting competitions and has created sculptures to raise cancer awareness, AIDS awareness, celebrate world peace and even created a replica of the Taj Mahal out of black sand to celebrate the building's 350th anniversary. Pattnaik isn't a stranger to setting records. He tells Mohaptra that he has set 23 sand sculpting records in the Limca Book of Records, an India-only version of Guinness. But setting a world record is special. "We are happy after breaking the previous Guinness world record," he tells Press Trust India. "This achievement will encourage me to touch new milestones." "They took nearly one hour to verify my art and measure the height before making the official announcement," Pattnaik says. While Pattnaik's structure is the world's tallest sandcastle, it is nowhere close to the world's tallest sand sculpture, an epic 73-foot, 7-inch tall creation certified by Guinness. It's called, "Why Is the Hummingbird King of All Animals" and was built during the Zhoushan International Sand Sculpture Festival in China in 2010. This is probably the coolest thing ive seen on this site. That sandcastle is probably taller than some peoples houses. What an impressive work of art. It may have taken one hour to measure the height because the sand castle does not go straight up. One would have to be careful not to destroy it in their efforts to measure. I could not imagine taking nine days to sculpt a sandcastle considering conditions of wind at the beach and monitoring the sculpture at night. As a kid, I could never even manage to properly build one tier of a sandcastle from a pail. I admire the message that the sand castle sends, people are sending many creative opinions out in these times. It was probably so difficult to measure because of careful the measurers needed to be. This is a very impressive piece of art. It had to take such a long time to build because sand can be very difficult to work with. This picture shows us how the world's largest sand castle was built, how big it was, and what the creators wanted it to represent. I can tell how the castle was built because of the machines in the picture. I can also tell how big it was by looking at a side by side comparison of the building and a human standing next to it. I am also able to tell what creators wanted it to represent by the bird and the sign that says "world peace" beneath it. 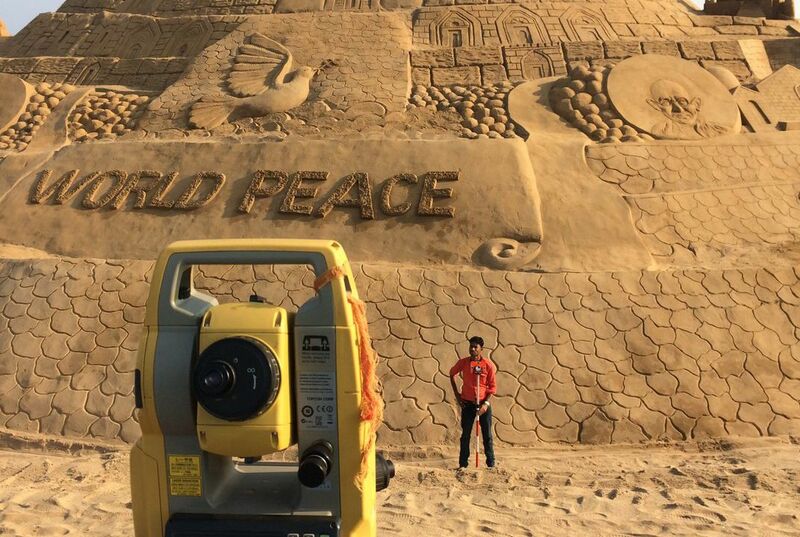 Overall the photographer is showing us that the people who created this castle wanted to make something that the media would pick up and they wanted it to include a message, that's why it says world peace on it. It took 1 hour to measure the height because the supervisors had to check and re-check the height of the sand castle. They also had to be precise with the height of the sand castle because if the height was wrong and they falsely reported it, it may have not broken the record when it actually did. If supervisors miscalculated the height and reported that the castle did not win the record, than Pattnaik would have lost the opportunity. I have a connection to this. We did a thing like InVenture (GA Tech Invention competition) at my elementary school in my ALP (Advanced Learning Program) class. When our teacher, Mrs. Mendenhall, was judging our products, she had to take a lot of time to judge them and decide which won, which had 2nd place, and which was 3rd (me and my friend Daniel were working together and we won 2nd place). I think it took over one hour to measure the height of the castle due to the curved shape of the castle. It is easy to measure something that it standing right side up but when it is curved you almost have to "bend" a ruler. Also with all of the structures intricate details you must be very gentle. I think it took one whole hour because you need to get to the top without 'hurting' it. Also it isn't straight up so that would make it longer than usual.